Eighty degrees on a beautiful Oregon day in July and I decide to take my two older children to the track for a run as a part of my recent mission to finally get back into shape after my injuries from the war. Eight years ago I was sent home from Iraq after a violent ambush. The right side of my body was smashed in a vehicle borne IED and a good friend of mine named Eric McKinley was killed instantly. I was in critical condition for a month or so and had a couple compound breaks, torn muscles, cracked ribs, damaged knee and rotator cuffs. I had run marathons in my youth, but to be honest I never liked to and wouldn’t have if the choice had been mine. In the regular army infantry you usually had to run whatever marathon that happened to be near where you are stationed. When I was in Schofield Barracks, Hawaii, we did the Tower Run and the Honolulu Marathon, in Germany we ran through the mountains in Bavaria to what the natives called the Hochkreuz, in upstate New York we ran every day rain, sleet, or snow unless the temperature was twenty below zero or more. When I was convalescing the doctors told me that I may not walk again without a limp because of the damage to my knee and the way my fibula broke so when I healed up I started running with a friend who had been in a Ranger Battalion just to prove I could do it. He was patient and helped me a great deal, but I stopped after a few months and haven’t run since. I guess the pain of has stopped me for the past 8 years, but I turn 40 next January. The second half of my life has started; this is a fact I can’t ignore. I have a three-year-old daughter and since 2008 I have gained about ten pounds a year. I figured at this rate I would be that morbidly obese old vet in a motorized wheelchair at her high school graduation, or to my older children’s college graduations, or their weddings. Eric’s death plays a big part in this as well. I was his squad leader during the war and I was responsible for him. He is gone now. He is gone, but the responsibility isn’t. Some people can call it survivor’s guilt, but really the only way I can make sense of the fact that I lived and Eric didn’t is to make my life a monument, a memorial. People who meet me don’t need to know the whole story. They don’t need to know who Eric was or how and why he died, but I want them to know I am a good person trying to live up to my full potential and this includes being physically fit. I’m doing this for my kids, for Eric, for my wife, and even for myself because I have found after a good work out my head is clearer than any VA issued PTSD drug can make it. You would think with all that motivation I would have hit my target body weight in a week. We get to the track and stretch and I see a half dozen kids in their early twenties running. God it used to be so easy. I remember running being easy. I never enjoyed it but there was a time when I didn’t feel like a pile of man-shaped junkyard trash smashing its way around an eighth of a mile circle. My son is seventeen and my daughter sixteen and they both take after me when I was their age, which is to say they are athletic and coordinated enough to do well in sports. Being a father to grown children is tricky because you want them to be better and do greater things than you ever did, but there is still that part of you that wants to be their hero, to out do them at everything. Standing there stretching, it was pretty obvious that my son would outrun me, even lap me. He has the build of an Abercrombie and Fitch model and plays several high school sports. I’ve been running with my daughter for the last month or so and we were pretty well matched, but recently she’s been improving at a faster pace. So, I accept the fact and we start out at a light jog. It’s hot as hell and my right calf starts to swell before I finish the second lap. I had torn my fascia pretty bad in the ambush. This is a type of muscle sleeve that keeps all your parts below the knee looking like a calf. It swells and feels like a balloon ready to burst, but I run through it. At the first mile my son laps me, but I am unlapped when he stops to get some water. I glance back and my daughter is still jogging about a half lap behind and my son starts up again. Six laps in, my knee is on fire, my breathing is off, and the sweat is pouring down my spine. I stop and my fists are balled up because I’m pissed that I have to walk for a while. Shaking out my legs don’t help and there I am speed limping until I glance back and see my son only a quarter lap back. I start up with jog. He catches me at the beginning of lap seven and I watch him speed past me and on the second half of the lap he starts sprinting. My chest fills with pride, but while he’s panting and doubled over at the finish line I give him a smile and keep on jogging. I made a rule to myself that I’m doing at least two miles every other day this month, three miles in August. In the end, they both catch up and finish before I do. I like to say that I’m over twice their age and I was blown up, but it wouldn’t matter. They are young and I’m out of shape, but even if I don’t lose all the weight I feel I need to I know I just have to keep going. Getting to the track is the hardest part, not the running. Commitment isn’t enough, this is a lifestyle and behavior change and that is the hardest part. I’ve been running for a month now and I’m going to keep running, biking, and working out. All the different reasons will keep me running, but maybe there is one more. Maybe I can help other combat injured veterans, or maybe I can help motivate other people even if they aren’t veterans. 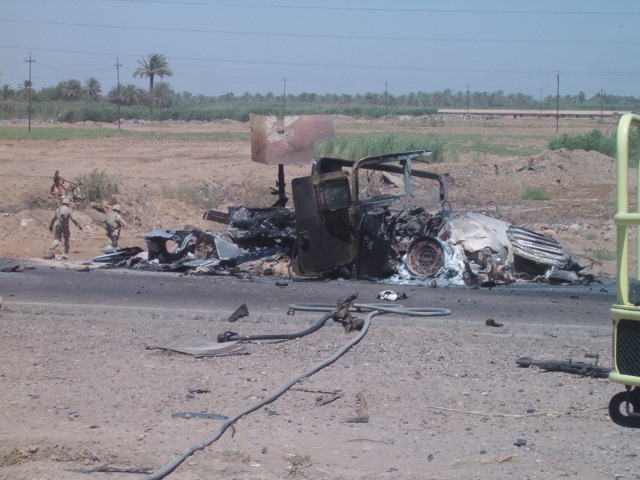 This was my humvee fifteen minutes after the ambush. I was sitting in the passenger seat. I lived through this.